If you're currently seeing display ads or ZergNet content recommendations in the middle of your homepage then we have the guide for you! This guide will show you how to add a "CSS Class" to <body> element of your website based on the type of page you're browsing such as homepage, archive page, or a single post page. That CSS Class you'll be adding will help our "script wrapper" separate out your homepage from your post pages. Once you complete this tutorial, you'll need to email us at publishers@mediavine.com so we can update what we call your "content selector" on the back end. 1. 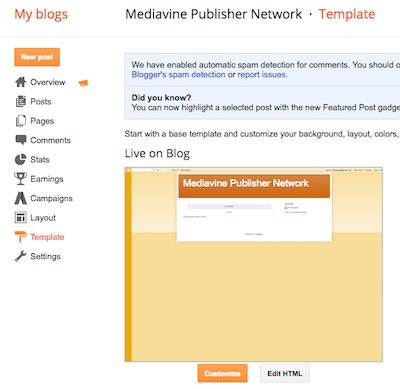 Go to the "Template" page in your Blogger Admin. 2. Under the template that's listed as "Live on Blog" you'll click the Edit HTML button. 3. You'll be looking at a bunch of HTML. You're going to want to look for the tag. 4. Click "Save template" and then email us. You're done!